Calgary Rants: My Favorite Posts of 2009! Wow...what a year it has been! I thought a nice lazy post would involve me looking back through all of my posts in 2009 and making a quick list of my favorite ones. Going through the list I was amazed at some of the things that were going on politically and locally during the year, most of which seems so irrelevant now. I found that many of my beliefs on some of these subjects were different than what I think today, which I found fascinating. As I creep up on my first year of blogging, I am amazed at some of the nonsense I write about! January: WOW! Could they be any more arrogant? March: When did Calgary become a Socialist city? June: George Dadamo...One Ambitious Fellow and WAP Leadership Race via Social Network Stats! July: Only $25Million for this Peace bridge...are you sure? August: McCarthyism & Why the Wildrose Alliance will never succeed! 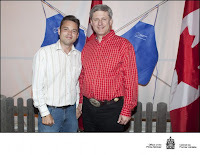 September: Wildrose Alliance Membership Sales.... PART 1 or Who Is the Best Looking Candidate? October: Alberta PC Party...Be Careful What You Wish For! December: Who Is Really Blocking Alberta's Cellphone Law? 1) Concrete Equities.."No Money Now....or Later? My Favorite moments of the year? 2) Meeting the Prime Minister! Well, it has been a blast! Happy 2010 to Everyone and I look forward to wasting more of your time in the new year!